The Lobsterpot is an beautifully presented dog friendly holiday cottage in Norfolk, situated in a quiet cul de sac just a short walk to the beautiful beach at Overstrand. The property is furnished and styled with a Scandi feel to it . 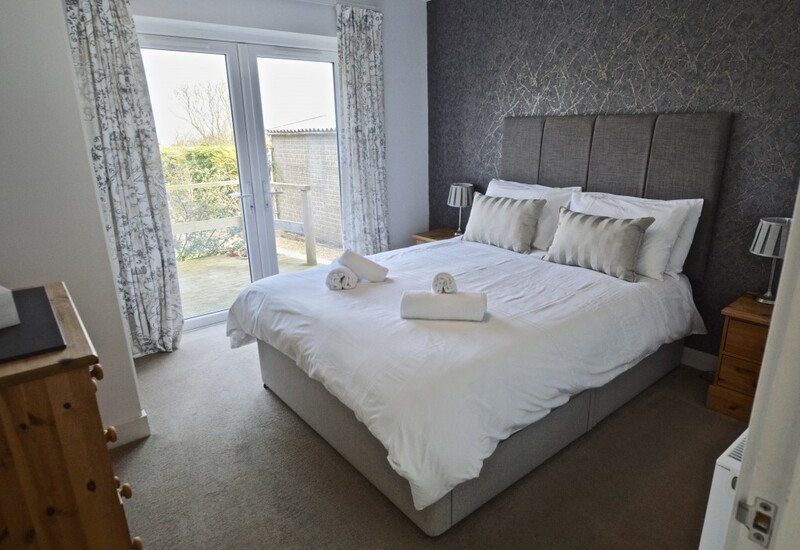 The main bedroom, with a boutique hotel design, has French doors to an attractive deck which gives glimpses of the sea, just to remind you how close you are to the beach! Kitchen: Fitted kitchen with gas hob and electric oven and, dishwasher, undercounter fridge freezer, microwave, toaster and washing machine. Well equipped. Iron and Ironing board, clothes airer. Door to rear garden. Bathroom: Contemporary bathroom with large walk in shower, WC and basin, heated towel rail. Bedroom 1: Good sized elegant bedroom with king sized bed, decorated to a boutique hotel style standard, comfortable mattress, bedside tables and lamps, fitted wardrobe. Hairdryer. French doors to deck. Partial distant sea view. Linen and towels provided. Bedroom 2: with full sized single beds, bedside table and lamp, distant sea view. Outside: The house is situated in a quiet cul de sac just a short walk to the beach. The gardens are lawned. To the rear is an attractive decked area with garden furniture. There are distant partial sea views from here. Summerhouse. A lovely spot to sit in the garden in more inclement weather. The Lobsterpot- Dog friendly Holiday Cottage in Norfolk. Overstrand is an historical fishing village 2 miles from Cromer and was known in Victorian times as the Village of Millionaires and was a favourite haunt of Sir Winston Churchill.